Simple yet sophisticated, peanut tofu lettuce wraps are a dynamite meatless meal. Tofu and corn are marinated in a savory Asian sauce before the mixture is sauteed with chopped water chestnuts and peanuts. This healthy and filling meal can act both as an appetizer or main course. You can serve these lettuce wraps family style or individually portion the tofu mixture into leaves. 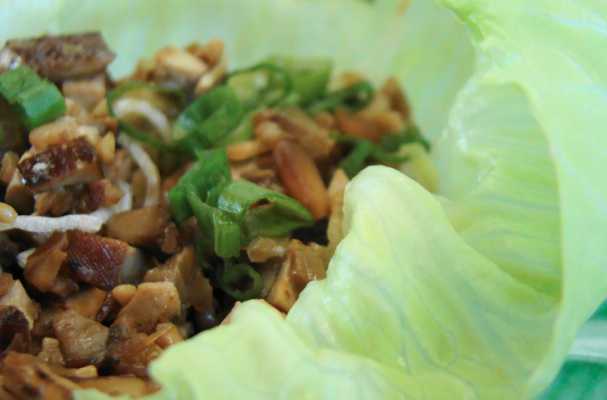 One bite, and you will be hooked on these delicious peanut tofu lettuce wraps. Step 1: Combine all the sauce ingredients in a bowl and whisk them together until combined. Step 2: In a separate bowl, add the corn and tofu along with about 3/4 of the sauce. Allow the mixture to marinate for 15 to 20 minutes. Step 3: Heat a large skillet over medium heat and add the sesame oil. Add the tofu and corn mixture, 1/2 cup chopped peanuts, and water chesnuts and sauté for 10 minutes. You may need to moisten the pan with a little bit of water, oil, soy sauce, oyster sauce, or lime juice. Remove the pan from the heat and allow the mixture to cool slightly. Step 4: Scoop the tofu and corn mixture into lettuce leaves. Garnish with cilantro, green onions, remaining 1/4 cup peanuts, and the reserved sauce.